Unregulated mining has the potential to release harmful substances into the soil, air, and water. Mission 2016 proposes that governments enforce regulations on companies and use cutting-edge technology to reduce the damage from mining-related sources. As more mines open in countries with varying levels of environmental protection, it is increasingly vital that safeguards established by the Strategic Minerals Association (SMA) are in place before operations proceed (see the international regulation page). Environmental hazards are present during every step of the open-pit mining process. Hardrock mining exposes rock that has lain unexposed for geological eras. When crushed, these rocks expose radioactive elements, asbestos-like minerals, and metallic dust. During separation, residual rock slurries, which are mixtures of pulverized rock and liquid, are produced as tailings, toxic and radioactive elements from these liquids can leak into bedrock if not properly contained. Underground mining has the potential for tunnel collapses and land subsidence (Betournay, 2011). It involves large-scale movements of waste rock and vegetation, similar to open pit mining. Additionally, like most traditional forms of mining, underground mining can release toxic compounds into the air and water. As water takes on harmful concentrations of minerals and heavy metals, it becomes a contaminant. This contaminated water can pollute the region surrounding the mine and beyond (Miranda, Blanco-Uribe Q., Hernandez, Ochoa G., & Yerena, 1998). Mercury is commonly used in as an amalgamating agent to facilitate the recovery of some precious ores (Miranda et al., 1998). Mercury tailings then become a major source of concern, and improper disposal can lead to contamination of the atmosphere and neighboring bodies of water. Most underground mining operations increase sedimentation in nearby rivers through their use of hydraulic pumps and suction dredges; blasting with hydraulic pumps removes ecologically valuable topsoil containing seed banks, making it difficult for vegetation to recover (Miranda et al., 1998). Deforestation due to mining leads to the disintegration of biomes and contributes to the effects of erosion. ISL mining has environmental and safety advantages over conventional mining in that the ore body is dissolved and then pumped out, leaving minimal surface disturbance and no tailings or waste rock (World Nuclear Association, 2012). There is no ore dust or direct ore exposure to the environment and a lower consumption of water is needed in the mining process (International Atomic Energy Agency [IAEA], 2005). However, the strong acids used to dissolve the ore body commonly dissolve metals in the host rock as well. The fluids remaining after the leaching process commonly contain elevated concentrations of metals and radioactive isotopes, posing a significant risk to nearby ground and surface water sources (IAEA, 2005). Additionally, the low pH of ISL mining wastewater can result in acidification of the surrounding environment. Environmental issues with heap leaching are centered on the failure to keep process solutions within the heap leaching circuit. Release of toxic heap leaching fluids into the environment can affect the health of both the surrounding ecosystem and human population (Reichardt, 2008). Water balance is crucial in heap leaching projects because of the possibility of the overflow of solutions containing toxic concentrations of heavy metals after a heavy rainfall or rapid snowmelt (Norman & Raforth, 1994). In some cases cyanide is used to extract metals from oxidized ores and the resulting leach ponds have caused significant wildlife mortality, including the deaths of about 7,613 animals between 1980 and 1989 at cyanide-extraction ponds in California, Nevada, and Arizona (Eisler, 1991). Brine mining involves extracting and evaporating the brine solutions to remove harmful elements and compounds (Gruber et al., 2011), potentially releasing them into the environment. The drilling and transport of brine solutions can disrupt existing ecosystems and well casings, pipelines, and storage tanks are subject to corrosion due to the high salinity content of the solutions that they are exposed to, which can lead to leaks and contamination of adjacent bodies of water (New York State Division of Mineral Resources, 1988) Currently, there is no economically plausible plan to clean up contamination of an aquifer by sodium chloride and harmful concentrations of chloride inhibit plant growth and can cause fish kills (Division of Mineral Resources, 1988). All REE-bearing minerals contain low levels of the radioactive isotopes that can become concentrated in mine tailings. Radionuclides are released as dust during mining or from exposed waste rock stockpiles where they are least containable (and mostly airborne). Radiation can also leak into the ground, and nearby water sources after they have been separated into tailings, if the tailings are not stored safely. Once radionuclides are in an ecosystem, they accumulate in plants, where the higher concentrations are ingested and ascend the levels of the food chain (Paul & Campbell, 2011).Radioactive contamination has become such a problem that monazite mining has been banned by China and the United States has imposed strict regulations effectively accomplishing the same (Schuler, Buchert , Liu , Stefanie & Merz, 2011). When companies break up materials during mining, the dust can release a variety of heavy metals commonly associated with health problems. As dust, these minerals (such as the asbestos-like mineral riebeckite) can be absorbed into lung tissue, causing problems like pneumoconiosis and silicosis, commonly known as "Black Lung" (Paul & Campbell, 2011). Another example of harmful dust generated is flue dust, a byproduct of mining fluorine. According to the Chinese Society of Rare Earths, every ton of REE produced generates 8.5 kilograms of fluorine and 13 kilograms of flue dust, waste materials which contain the heavy metals discussed above (Schuler et al, 2011). 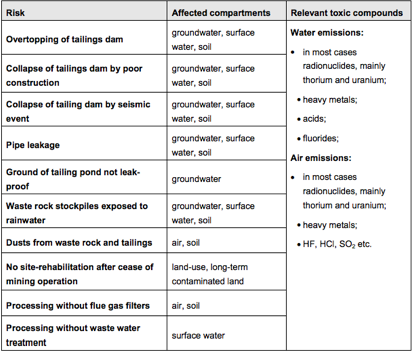 The following chart details how these contaminants enter the environment during mining and refining. Current mining and refining techniques make contaminant release common. Note: the two columns that involve waste rock and the column labeled, "No site rehabilitation after cease of mining operation" all involve mining specifically. This chart illustrates the many environmental hazards associated with mining. Mining, like most heavy industries, is dependent on fossil fuels, which generate the energy needed to operate a mine. To combat these carbon emissions, some countries have enacted regulations requiring emission credits, but many countries do not have codes dealing with carbon output ("Molycorp, inc.," 2010). Some form of environmental standards are needed for larger countries like China and Russia, and other developing countries that mine large volumes of strategic minerals. 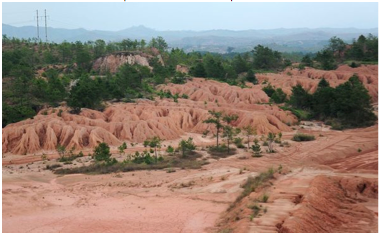 An example of the scarred land of a Chinese mine is shown above. Most modern mining techniques have high water demands for extraction, processing, and waste disposal. Wastewater from these processes can pollute water sources nearby and deplete freshwater supplies in the region surrounding the mine. Some mines, such as the Mountain Pass mine in southern California, have implemented waste-water recycling technologies, resulting in a huge decrease in water demands and liquid waste (Molycorp, 2012). We have compiled three short case studies of environmentally-harmful mines, to illustrate the results on the environment and surrounding community of poorly regulated or monitored mines. Greenland Minerals and Energy Ltd, based out of Australia, planned to open a mine in Greenland in 2013. However, the tailings disposal plan involved storing tailings in the Taseq lake, which will cause pollution of not only the lake, but the rivers leading from it and the ocean beyond. Fluorine, heavy metals, and radioactive decay products would all be introduced into the lake by these tailings (Schuler et al, 2011). Due to the lack of environmental regulations from Denmark, the country overseeing the project, plans for the mine continue to move forward, despite the harmful effects it would have on the environment and the surrounding community. Current estimates state that around 20,000 tons of REEs are illegally mined and exported from "off-grid" mines in China every year. It is unlikely that any of these illegal mines have environmental safeguards in place, which means that contamination, dust, and other wastes are not being addressed. This affects the health of the workers as well as destroys the surrounding environment (Schuler et al, 2011). In 2002, Molycorp had a problem with its waste disposal at Mountain Pass, when a pipeline leading out to evaporation ponds in the desert burst, spilling radioactive and toxic waste onto the desert floor (Danelski, 2009). The resulting uncovering of past spills, coupled with economic factors, caused the shutdown of Mountain Pass and a complete reworking of their environmental practices. However, the damage was done and the area and surrounding water sources are affected, perhaps permanently. Case studies like these illustrate the result of ignoring the environmental damages of mining, and leaving them unaddressed or unregulated. Mission 2016's plan would address these issues. See the green mining page for more information. If no action is taken to remediate the many environmental problems inherent to modern mining, the end cost for governments and communities would be devastating. Already mines in China release 9,600 to 12,000 cubic meters of toxic gas containing flue dust concentrate, hydrofluoric acid, sulfur dioxide, and sulfuric acid for each ton of rare earth elements produced. Additionally, nearly 75 cubic meters of acidic waste water and one ton of radioactive waste residue are generated (Paul & Campbell, 2011). Preemptive actions such as stricter regulations and proper waste disposal strategies can reduce the costs of environmental damage, and in some cases pay for themselves. For example: the US company Molycorp spent 10 million USD on its paste-tailings operation, but the water and chemical reagents it was able to recycle saved have already paid for the installment, in addition to generating less waste. "Although the operating cost of the paste tailings operation is expected to be greater than it would be for a tailings pond... we expect that increased water recycling and reduced environmental risks associated with the paste tailings facility will ultimately mitigate that additional cost" (Molycorp, 2012). Mission 2016's plan will increase recycling efforts, greener mining and refining techniques, reduce the cost of environmental damage on the surrounding community, and increase government involvement in the regulation of dirty mining practices. Eisler, R. (1991). Cyanide hazards to fish, wildlife, and invertebrates--A synoptic review. U.S. Fish and Wildlife Service Biological Report 85(1.23), p. 55.
International Atomic Energy Agency. (2005). Guidebook on environmental impact assessment for in situ leach mining projects. Retrieved from http://www-pub.iaea.org/MTCD/publications/PDF/te_1428_web.pdf. World Nuclear Association. (2012 June). In Situ Leach (ISL) Mining of Uranium. World Nuclear Association. Retrieved from http://www.world-nuclear.org/info/inf27.html.